I went to Lewes yesterday and popped into a local fleamarket where I discovered a nice range of garden statues and other religious statues. I am looking for a nice statue for the allotment and found a nice St Therese of Lisieux. I guess she will be wanting some kind of roses archway or something at the back of the allotment. There were other statues as well, which are quite reasonably priced. He had more than one St Therese of Lisieux and a couple of statues of Our Lady. It was so sad to see this statue of St Anthony of Padua without a head for Our Blessed Lord. Is there anything we can do to save this statue and repair it? It has been there since the last time I went into the fleamarket and it really angers and saddens me that the Lord has no Head! I think you will agree with me that something must be done! Aaaaagggggh!!! Moving swiftly on. More statues here, some nice, some not so nice. May God be praised for the result of yesterday's vote in Parliament. I consider what happened in Parliament yesterday to be nothing short of miraculous. I am sure that while the US and, going by this piece, Israel are unhappy about this vote, which reflects the distaste British people now have for 'humanitarian intervention' on the basis of deeply suspect evidence, the House of Commons will also be thanked by Syrian Christians, by whom Assad is supported, in the face of Islamic fanaticism, persecution, violence and extremism. Quite how Israel benefits from the Muslim Brotherhood toppling Assad's regime is beyond me, but then I'm no expert on politics in the region or the strategic end-games in the middle east. The next time Israel wants the US and the UK to fight wars on its behalf, they should just be honest and say so. I really do wonder sometimes. Let's just imagine for a while that a some Muslims, or even some Catholics, got together and got loads of guns, ammo and bombs from a nation friendly to the idea of an uprising against HM Government, that gave us such nuggests as 'gay marriage' and abortion - the killing of citizens in the womb by the State. Let's just imagine that either the Muslims or the Catholics in the UK thought democracy had had its day and wanted either a full-scale theocracy and Sharia law (in the case of Muslims) or a Catholic monarch in the case of Catholics. Imagine that either of these two parties were funded and backed by either some Islamic country abroad or by, I don't know, Poland, or something, in the case of Catholics. There are some wonderful images, at the LMS Chairman's blog, of the Solemn Profession of Br Stephen Morrison at the Norbertine Community of Chelmsford. I met Br Stephen when I visited the community of Premonstratensians a while back. Pray for him and pray for the very wonderful Norbertine order at St Philip's Priory. He very kindly invited me to go to his Solemn Profession and I'm afraid I don't have any excuses that won't sound absolutely pathetic, so I'm sorry for not making it, Stephen, and may God reward you for your generosity to Him and bless you in your vocation. May it be glorious and fruitful. Many congratulations to him. I so wish I was there! Here is a photo of Br Stephen with Br Pius Collins in Lazio that I robbed from Br Stephen's Facebook page. The Catholic world reacted with shock this week when it was revealed by a leaked memo on a parish newsletter that 'A Call to Action' (ACTA), the terrorist organisation which online intelligence agencies suspect to be linked to overseas dissident organisation 'Call to Action' (CTA), are alleged to having been supplied with sanctuary by President of Evangelisation and Catechesis, Bishop Kieran Conry. It is also believed that the ACTA splinter group have used weapons of Mass-destruction on their own people in the past and are intent on doing so again. The Catholic Church asked itself this question in 1976. The answers it gave were optimistic. Is it time to ask the same question in 2013, when only 75% of those remaining Catholics who didn't walk away in the radical 70s believe the Real Presence of Our Lord in the Blessed Sacrament today? 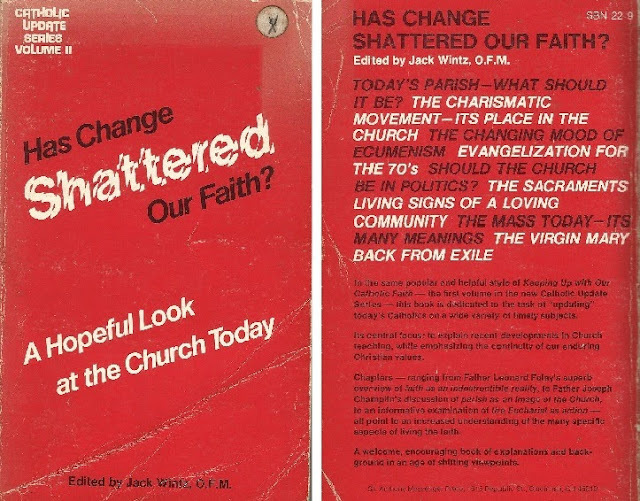 Read more at The Guild of Blessed Titus Brandsma for a book review of a pamphlet created in the immediate aftermath of the changes that swept through the Church in the wake of the Second Vatican Council. There's an interesting review by another Guild member of some of Mgr Benson's books on the same site. That's right - I'm plugging the Guild. If you are a Catholic blogger faithful to the teaching of the Church, do think of joining. It is the Feast of Our Lady of Czestochowa today. It is also a bank holiday. See...Our Lady hasn't given up on England after all. Now, please can we have all our other Holy Days as holidays as well? Did Your Parish Priest Mention 'the H words' Today? The parish priest at the morning Mass I attended mentioned Hell, Heaven, Damnation and Salvation. I really fail to see how any parish priest could sing or proclaim the Gospel today without mentioning the 'H' words - Heaven and Hell in his homily. It's kind of obvious what Our Blessed Lord is talking about. You wonder how a priest manages to wriggle out of this one. The parish priest at the evening Mass at the other Church I attended somehow managed to get through the homily without mentioning the 'H' words but then again even the Holy Father managed it today. Yikes. Syria is a potential flashpoint with Russiaand William Hague is banging the drum. Is it an oil drum or some other kind of drum? We don't yet know, but 'humanitarian principles' is one motive I doubt. Iraq, Afghanistan, Syria, Egypt...then Iran?...the West is driving ahead with a foreign policy that is taking in, by hook or by crook, middle eastern states. Exactly for how long is Russia going to put up with the line of middle eastern states being overthrown, undermined and eventually invaded? Until the West gets to the border of Russia? Okay, I admit my geography is bad but you get the gist. Meanwhile, are the world powers gearing up for something big? Really big? The last time they did, we had this in the United Kingdom. 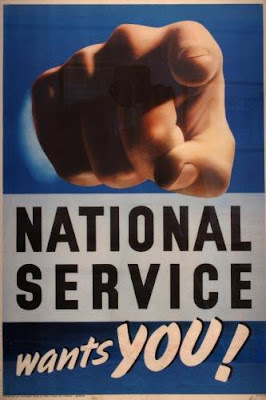 National Service? Oh boy. Our Lady of Fatima, pray for us. The phone call by His Holiness Pope Francis to an Italian student in Padua who had written to His Holiness about his hopes for the future after graduation has raised eyebrows, including those of Fr Alexander Lucie-Smith. Pope Francis asked to be called 'tu' by the Catholic layman. Fr Alexander says that this is noteworthy because the more polite and reverent 'lei' is used for addressing members of the hierarchy of the Church. The news reports suggest that this is to be a wet, wet weekend, at least on Saturday. A washout, in fact. Say a prayer for the pilgrims making their way from Ely to the Walsingham on foot with the LMS for the conversion of this poor country. You can follow, as usual, the pilgrims' progress on the blog of the Chairman of the LMS. I expect there will be some, perhaps many, making their heroic way to Walsingham praying for the protection of the Traditional Latin Mass declared by Pope Benedict XVI to have been 'never formally abrogated' but which, in the light of the decision to restrict it for the Franciscan Friars of the Immaculate, may be under general threat. Our Lady of Walsingham, pray for England, for the Franciscan Friars of the Immaculate and pray for the safeguarding of the Mass of Ages. Ora pro nobis! Tim Stanley has written a good post on his impressions of the still young papacy of Pope Francis. The article is very refreshing and because it is about His Holiness, is also quite challenging. Pope Francis is a Pope who continues to surprise. He doesn't like the idea of comfortable Christians and from what we have seen so far, may well leave his flock on the edge of our seats. A week or two ago His Holiness told us not to try and convert the poor man, but to give to him and 'Jesus will do the rest'. This week, he tells us that if we do not give the poor Jesus Christ then we have done very little for them. With Michael Voris and Fr John Zuhlsdorf of WDTPRS offering a luxury 'Retreat at Sea', a small group of English Catholics, including priests and laity have organised a rival 'Retreat on Sea'. While Voris and Fr Z take guests on a cruise from Ft Lauderdale to the Bahamas on cruise liner Royal Princess, the English offer is, I think you will agree, just as exciting and easier on the pocket. Leaving Newhaven Harbour at 6am, join the 'Retreat on Sea' while fortunate guests who can afford the fee of £39.50 will be able to take in the beautiful coastline of England - as long as they are on the top deck as they leave England - and arrive in sunny Dieppe, France just four hours later. There, in France, guests will be able to buy some cheap cognac and cigarettes, pay a visit to a local Church and enjoy the exciting Saturday market of the beautiful coastal French town. 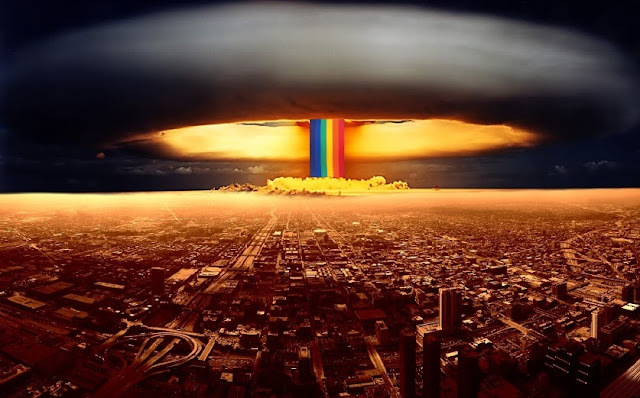 New images show that the UK Government has developed a range of big gay nuclear bombs with which to deter Russia from continuing to enact or act on any legislation that might in some way prohibit the promotion of homosexuality in society and especially to Russian children. Fry, discussing his meeting with David Cameron was frank about the exchange with the Prime Minister. If weeds, which are unsightly to our eyes, can grow through gravel, or even on concrete, how much easier then can vices, which are unsightly in the sight of God, grow in the soul. That's the fruit of my meditation, having spent another day on my knees harvesting weeds at St Cuthman's Retreat Centre in Horsham. Let it never be said I am workshy, readers. My knees are killing me. I am reminded once more than when you spend a day picking weeds out of gravel that when you close your eyes at night, you can still see them. You close your eyes and all you can see is weeds! In order to remove weeds from our soul, we need to confess our sins and be faithful to prayer, examine our consciences and take out our vices by the root. The Lord removes weeds and sow virtues in our soul. To grow a beautiful garden, with a variety of beautiful plants takes commitment and faithfulness every day. It is no different for us with the soul. 'Groups all over the country are sleeping out on the night of August 24th to protest at the way bedroom tax and other benefit cuts are threatening the security of people's homes, resulting in mass homelessness. Bedroom tax is a cut to housing benefit for council and housing association tenants who are living in houses deemed to have "spare" bedrooms, according to inflexible government rules brought in this April. If you suffer from epilepsy, best not to gaze too long at this picture of Our Blessed Lady. I have found an excellent resource site on Our Lady of Fatima, the message of Fatima and a wonderful source of devotional material to the Blessed Mother of God. Age of Mary is a website set up to raise awareness of the era in which we now live, when the message of Fatima remains so important. It also has the Little Office of Our Lady in English, with all the hours included, an online Rosary, the total consecration to Mary, information on the Brown Scapular and Miraculous Medal. I haven't seen that many websites dedicated to Fatima, but of those I have seen this is surely the best. Wednesday 21 August will see the first joint celebration between the Catholic Church and the SSPX in Catholic Churches for the Feast of Pope St Pius X. The liturgical celebrations will be kicking off this week at one Catholic Church in a coastal region of the South - with final touches to the schedule being applied in the days running up to the exciting joint initiative. So far it is known that hitherto unknown liturgical preferences which developed during St Pius X's pontificate will be a part of the Mass concelebrated by several SSPX priests with Diocesan priests in the region. 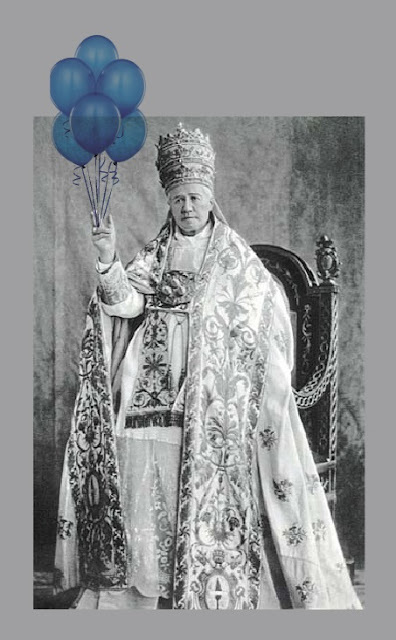 The controversial 'balloon Masses' of 1910 are being revived as the ecumenical initiative seeks to build on common ground shared by the SSPX and the post-Concilliar Church. 'Pelagius (fl. c. 390-418) was an ascetic who opposed the idea of predestination and asserted a strong version of the doctrine of free will. He was accused by Augustine of Hippo and others of denying the need for divine aid in performing good works.